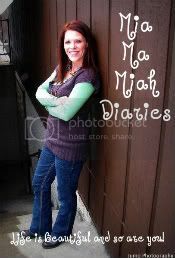 Blog Spotlight | Mia Ma Miah’s Diaries! I am a midwest girl. Born and raised in the Quad Cities (Moline and Rock Island, Illinois and Davenport and Bettendorf, Iowa) right along the Mississippi River. I am a real mom trying to raise my 3 girls the best that I can with what I have. I juggle so many different tasks that sometimes I wonder how I get through a day. I am only 35 and I was married for 11 years and now divorced. I live with my high school sweetheart and between the 2 of us we have 5 kids. I have had a life where I didn’t have to worry and I have been broker than broke. I have owned my own salon, been through many many…ups and downs but I always seem to make the most of every life situation and find a way to come out learning. Mia Ma Miah’s Diaries is an outline of my life. I do and love almost everything EXCEPT cook! It is a place to share my mom adventures, post my thoughts, share ideas, and hope give a little inspiration to other women. It’s everyday life of a busy mom. I am a mom of 3 girls, 14, 10, and almost 2 which takes up almost all my time. I have been a hairstylist for 15 years, a Just Jewelry Consultant, and now an addicted Blogger. I also like to feature other businesses annd products as well as my own. I don’t do many reviews yet because there are so many great bloggers that do so I leave it all up to them. I started blogging only in November 2009 and since I been so busy sharing and learning that sometimes I think my head might pop off! I really didn’t mean to. I wanted to start a website for my Just Jewelry business and a friend suggested blogger or wordpress since they were free. After creating my Just Jewelry by Jessica (www.justjewelrybyjessica.com) blog I decided I loved it and thought it was a great way to express what was going on in my life that day. My daughters names ar Michaela, Madison, and Miah. But it really started when Michaela would always call Miah as a baby Mia Ma Miah. After looking at it is actually the begining of each of their names. And that is how Mia Ma Miah’s Diaries was born. Well, the obvious would be Just Jewelry and I am starting to slowly sharing my favorite hair products I would recommend to anyone. But there are so many woman and mom made items and products that it is great to showcase and feature those. I am a Gift Certificate kind of gal! I want my readers and followers to be exited to win and if they get to choose what they win from Just Jewelry then all the better. Almost everyone. I write about everything. And I am a jack of all trades with the exception of cooking. So I would not be much help to others on that. Definatley moms, those that stay at home and/or work at home. Those that love to remodel, decorate, and spiff things up. Everyday it continues to grow and I would love to be able to reach out and help other moms that are where I have been. I have been through many ups and downs, through divorce, single parent, business, and dealing with not-so-friendly people. Time! Blogging never ends and every site you go to there is always something new to read and learn. Everyday I learn something new with blogging. I feel that it is a great way to express and share with others what is going on in my life, in the world, and I just keeping meeting great new friends. I really don’t yet. I think if I would have to say one thing it would have to be that when blog hopping with Linkies that not everyone that has linked up reposted the Mr.Linky code so it makes it a little harder to hop around. But saying that I think the first few Blog Hops I enter I did the same. I can’t stress enough about leaving comments. Alot of times you go unnoticed and it is the best way to show support for one another. You can never have enough support and Love for what you do. So always share, respond and share the love. What a great idea. Happy SITS ShareFest!! .-= michelle´s last blog ..A give away for Diaper Wipe solution =-.